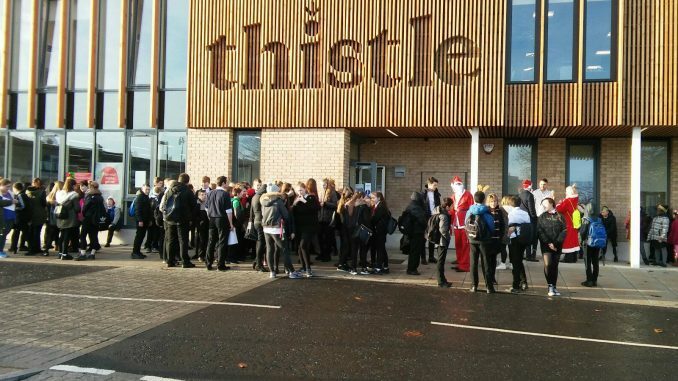 The Thistle Foundation updated us on their one mile sponsored Santa Walk which took place last Wednesday (14 December). Dressed in Santa suits they brought some festive cheer to Craigmillar and raised much needed funds for the charity’s work. Staff and volunteers were joined by members of the local community, pupils from Castleview Primary and Castlebrae High Schools, pro boxer Stephen Simmons and the cast of reality show Glow for the event. The walk started and finished at the charity’s newly opened Centre of Wellbeing, and concluded with a Christmas party and carol singing. Images provided courtesy of the Thistle Foundation.